The time has come. 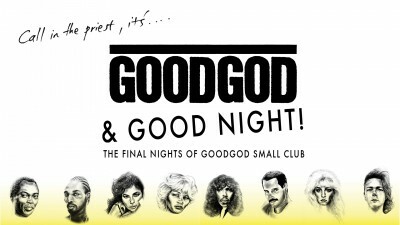 Goodgod Small Club will be open for just two more weeks before we pack up shop to go walkabout. The great news is that we are handing over to a brand new crew who will continue to run the place as a venue – please get familiar with PLAN B. Goodgod’s last night will be Saturday December 12, but fear not, all gigs and parties that have been announced beyond this date will continue at PLAN B – including the huge the Rhythm of the Night NYE. Belly Bao are staying put also and will continue to steam on for you as strong as ever. Goodgod is nothing without all of you, so thank you for coming down night in, night out and making it such an inclusive and uplifting Small Club to both work and play in…big love and please stay tuned for GG’s next incarnations in the new year. PELVIS, BEN FESTER, NOISE IN MY HEAD – Goodgod’s second last night front bar rave! KOWTON + CLIQUES + EK COLECTIVE – Astral People’s last Goodgod party!